New York City debutante Heather Fitzpatrick leads a double life—one that could see her tossed in jail if her secret is exposed. 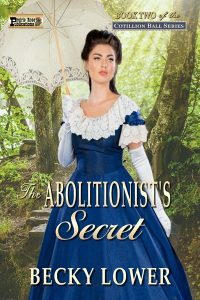 Though her mother is determined to see Heather land a husband during the society “season”, Heather has other things on her mind—such as her passion for abolishing slavery and her Underground Railroad activities. Handsome Army Lieutenant David Whitman arrives in New York City just in time for the whirlwind of activities that the season offers, but he has eyes for only one woman—Heather. When they dance at the Cotillion Ball, Heather loses her heart to him, as well, even knowing that his background as a Southern slave owner is something she can never accept. Yet, when he escorts her home, one kiss tells her she will forever be his—somehow. Romance blossoms quickly and an engagement follows, and when David must return home for a family emergency, Heather and her maid accompany him. But David’s mother, Mrs. Whitman, has plans of her own for her son—and they don’t include Heather Fitzpatrick! When Heather’s twin sister writes a damning letter in a fit of jealousy, it could be the tool Mrs. Whitman needs to put her son’s relationship with Heather to an abrupt end. Can David and Heather create a future together in spite of THE ABOLITIONIST’S SECRET?